Hampton Court Palace is a palace filled with stories and treasures to discover giving the palace its unique romantic appeal, but with reminders of its turbulent past at every turn. When visiting Hampton Court Palace we recommend that we spend time seeing Henry VIII’s Apartments, the Kitchens and Henry’s Imperial Crown. Also you must spend time in the Beautiful Gardens and the amazing Maze. We also advise that you see Mantegna’s Triumphs of Caesar, William III Apartments and The Gregorian Private Apartments. - Hampton Court Palace is located 35 min. by train outside London. - Trains leaves to Hampton Court Station from Waterloo Station. - You can use your Oyster Card to get to Hampton Court Station as it is in zone 6. - Child tickets are for children between 6 and 16 years of age. - Children from 0 to 5 years old are free together with a paying adult. - Ticket price incl. access to Hampton Court Palace, the maza, the gardens and a multi-language audio guide. 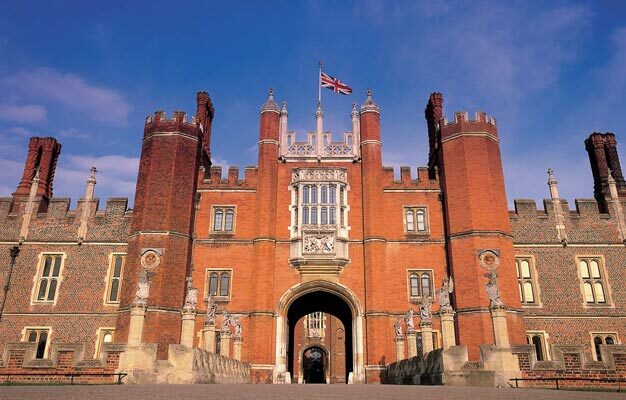 - Hampton Court Palace is open from Apr to Oct. 10:00 to 18:00 and from Nov. to Mar. 10:00 to 16:30. April to October: 10:00 to 18:00. November to March 10:00 to 16:30. Last admission one hour before closing.